Canals are an often overlooked part of maritime history and Dr. Louis Effler of Toledo, Ohio, recorded his boyhood memories of the Miami Canal and its vital part in Toledo history. He shared some of these memories when he spoke about the “Medical Aspects of the Miami and Erie Canal” before the Historical and Archaeological Society of the Ohio State Medical Association at Columbus, Ohio, on Saturday, April 15, 1950.Dr. Effler recalled that he and boyhood friends used to fish for bullheads in the canal’s stagnant waters, now covered by the Anthony Wayne Trail. The Miami Canal extended from Cincinnati on the Ohio River to Toledo on the Great Lakes and the better-known Erie Canal stretched from Buffalo on Lake to Albany on the Hudson River. The Canal linked the states of New York and Ohio in exchanging and transporting goods and people. Today the Anthony Wayne Trail, built on its old bed, represents the Miami Canal. The canal followed the present Anthony Wayne Trail from Maumee, emptied into Swan Creek and then continued through Toledo into Lake Erie. Beginning at Swan Creek near Erie Street, the Canal pushed southward in almost a straight line, then diagonally across Ontario Street. It continued along Ontario Street past the old Toledo Public Library at Madison and Ontario Streets, and then down Ontario Street to Adams and across the southwest corner of the courthouse grounds. Then it went down Michigan Street, across Cherry Street and past the old Libbey Glass plant, past the Autolite factory until it finally came out near the old casino at Maumee Bay. The Miami and Erie Canals were part of an inland waterway system connecting the Atlantic seaboard with the Gulf of Mexico, a system that provided cheap and rapid transportation to carry goods from the East to the Midwest to the South and back. Actual work began on the Miami Canal in 1825, and the Canal followed a route from Cincinnati north to Dayton to Piqua to Defiance and finally to Port Lawrence which eventually became Toledo. The Miami Canal paralleled the Great Miami River, which gave the Miami Canal its name. Digging the Miami Canal from Maumee to Manhattan (part of Toledo) was an engineering challenge comparable to building the transcontinental railroad a few decades later. All along the canal through Toledo from Swan Creek to Manhattan, later called “lower town”, shacks and huts of the diggers lined the banks of the canal. Canal workers, mostly Irish and German immigrants, had to grub and clear, which meant laying out a 40 foot wide stretch of bed and an additional 20 foot wide stretch on either side for banks and tow paths. Canal workers had to muck and ditch the banks on each side of the canal to ensure solid footing and safe crossing. They had to deposit gravel and clay along the canal banks for more protection, an operation called puddling. Puddling had to be done often because horses and cattle and people stamped down the clay and gravel banks or carried them away. Locks, dams and culverts were made of stone and wood and future generations would reclaim these materials for contemporary buildings. When the zoo at Walbridge Park in Toledo was built, stone and wood from the old canal locks were used. After many delays and difficulties including the panic of 1837 and “The Toledo War,” formal opening ceremonies for the stretch of Miami Canal that ran between Maumee and Toledo were held in 1842. By 1845, the first canal boat from Cincinnati arrived in Toledo and soon fleets of boats burdened with goods of all kinds plied up and down the Miami Canal. These fleets created heavy two-way traffic on the Wabash spur that went from Toledo to Fort Wayne and beyond. The war between the United States and Mexico began in 1846 and the United States government used the Miami Canal to transport troops from all points on the Great Lakes to Cincinnati and then down the Ohio and Mississippi Rivers to eventually reach Mexico. For the most part the Miami and other canals in the system were used for cheap and easy transportation. At three cents per mile, the canals offered the cheapest transportation until the railroads took over, and the Miami Canal began making money the day it opened for business. Freight vessels transporting wheat, lumber, lard and other commodities crisscrossed the canal and its connecting waterways and competing freight companies quickly established deluxe passenger or packet service that captured the imaginations of travelers, both actual and armchair. Teams of horses or mules towed the canal boats along a two path on either side of the canal and fresh teams were stationed along points along the route and transported aboard as needed. With this system a packet boat could average a speed of five miles an hour and hold a full complement of 35-40 passengers. Sleeping and dining in style, the passengers enjoyed a speedy passage from Toledo to Cincinnati over four days and five nights. 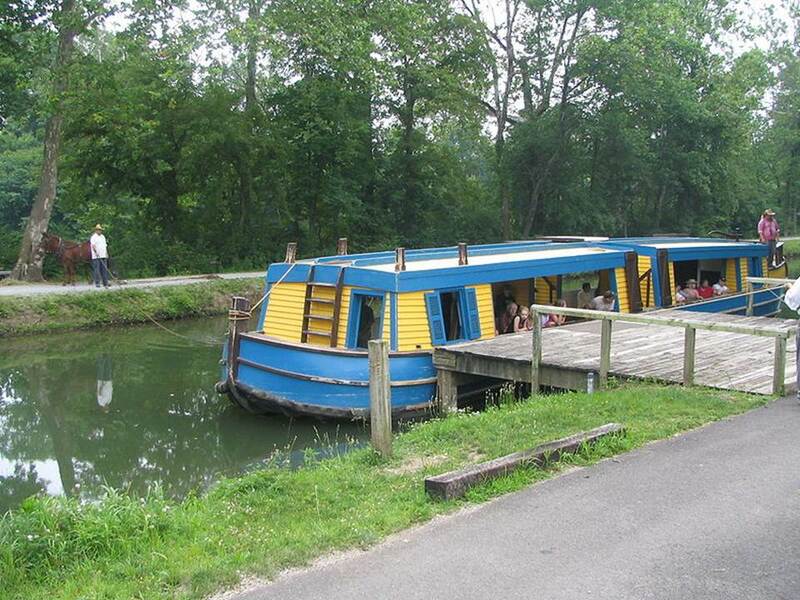 Canal boat companies competed with each other for business and passengers. Individual canal boat captains and their crews jostled each other for space and speed on the canals and the team drivers challenged each other- swearing, swaggering, chewing tobacco and cracking long black snake whips as they towed their vessels. Adventures and events enlivened every trip up and down the canal. Fouled lines, fights for the right of way, collisions, traffic jams and other mishaps enlivened placid stretches of time and water. During a busy day, as many as sixty canal boats at a time were lined up at Toledo docks waiting to load or unload and at the height of the Canal era, between 3,000 and 4,000 boats cleared from Toledo every year. According to Dr. Effler, the medical aspects of building the Miami Canal duplicated the Crusades in the Middle Ages, although on a much smaller scale. The development of the inland waterways helped settle remote areas and stimulate trade and commerce, but this progress came with a heavy human price tag. The digging of the Miami Canal was punctuated by rows of wooden crosses marking the deaths of Irish laborers, many of them imported from Ireland to work on the canal and dying of cholera, typhoid fever, and fever and ague. There were no doctors to counteract the effects of the Black Swamp. In the early settlement days, Jesuit missionaries doubled as the first doctors in northwestern Ohio. Then in 1823, Dr. Walter Colton arrived in Maumee right in the middle of the canal boom and treated people from both Maumee and Toledo. At this point, most people considered Maumee to be the coming lake port instead of Toledo,but eventually people decided that Toledo was more favorably situated at the mouth of Lake Erie. In 1834, Dr. Colton died of the same cholera that he fought so hard to treat in his patients. Settlers continued to pour into Toledo and more doctors followed, medical bags swinging alongside saddlebags. In 1834, Dr. Jacob Clark arrived and by 1838 while the Canal was being dug. Many of the laborers were too sick to work and Dr. Clark called Toledo “the most unhealthful spot in this section of Northwestern Ohio!” A believer in “bleeding,” he put his leeches to work during the cholera epidemic in 1839 that carried off many of the canal laborers. The close proximity of the shacks and shanties of the laborers along the canal right of way and the lack of sanitation helped spread disease and death. The year 1838 marked the most fatalities from the disease in Toledo history. The lack of rain from July 3 until October 15 caused the ordinary autumn fever to become epidemic and canal laborers provided most of the mortality figures, especially deaths from cholera, typhoid and “typhoid-malaria.” From June 1 to July 6, 1838, about 130 people died from disease in East Toledo. Since Toledo’s population numbered 8,000 people at this time, the death rate peaked at a disproportionate 40 to 1. Dr. Effler commented that the mostly German and Irish immigrants were addicted to heavy drinking that accounted for some of the fatalities. Many canal contractors operated liquor stores that sold to diggers. Drinking bouts often ended in fist cuffs, feuds and the dunking of combatants into the canal in a baptism of fire and canal water. By the mid 1840s, the railroads began their swift overtaking and overpowering of the canal system, forcing the boat owners to experiment with propeller driven boats instead of horse or mule drawn vessels. On the Miami Canal, a boat called the Scarecrow led the way and on the Erie Canal a boat called the Niagara overtook the horse and mule crews. These were the forerunners of a fleet of steam-propelled boats that ran from 1845 to 1855, chugging through the placid canal waters and presenting a state of the art face to the world. However, impressive as these propeller driven boats were, they didn’t change the travel time from Cincinnati to Toledo. It still averaged about five days and six nights. Even more so than the encroaching railroads, the propeller driven canal boats hastened the demise of the Miami Canal. The Scarecrow’s churning propellers tore up canal banks, increasing maintenance costs. Freight rate wars between railroad and canal operators drove canal operation costs far into the debit side of the ledger, causing freight rates to be reduced to almost zero. The Miami Canal Company fought to survive. Its legal department filed injunctions against the railroad for building bridges across the Canal right of way. The Canal situation became so precarious that the State of Ohio leased out portions of the Miami Canal to private companies for as long as fifteen years, but the private companies in turn neglected canal maintenance so completely that when they turned the Canal back to the state, the state pronounced it in a hopeless state of disrepair. In the 1860s, the state of Ohio abandoned large sections of the canal. By 1871 it had totally abandoned the Manhattan spur and the Fort Wayne spur met a similar fate in 1876. The Ohio flood of 1913 ended canal traffic throughout Ohio and in 1929, the Miami and Erie Canal officially closed. During its lifetime, the Miami Canal made important contributions to the growth of Toledo, contributions that equaled those of the railroads. The Canal helped farmers ship their produce and carried countless immigrants to their new homes and farms. It stimulated business and growth of many small villages along its right of way and brought settlers to live in towns, villages and cities like Toledo. It lives on in the hearts, minds, and boyhood memories of Toledoans like Dr. Louis Effler.